The most celebrated modern Panamanian art form, the mola (meaning cloth) has been a marker of Kuna culture since the early 20th century. According to Kuna lore, sister and brother culture heroes Kikadiryai and Ibeorgun, gave humans the art of making clothing to replace animal skins and feathers. They introduced thread, cloth and eventually scissors, and the art of constructing patterns based on nature and the invisible spirit world. Afterward, it is said all women became mola makers. Mola production, consumption and interpretation has been and continues to be controlled by Kuna women, despite shifting social, economic and political conditions in Panama. Kuna women spend many hours a day producing molas from the time they are children throughout their adult lives. 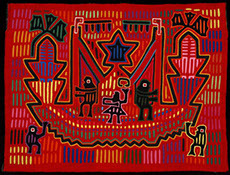 By 1925, molas were so closely linked to Kuna cultural life and ethnic identity that they were transformed into a symbol of resistance in the face of political and ethnic oppression. 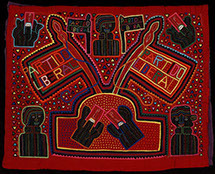 With the influxes of migrant workers from every part of the globe for the construction of the Panama Canal, a large American community, and a greater flow of tourists, came a new demand for molas. 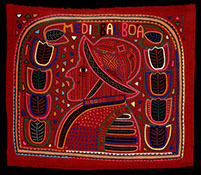 Women responded by producing molas for this new market while creating molas for their traditional wear. Today, there are cooperatives of Kuna women who specialize in mola making and many are recognized as artists locally and internationally. Mola with Amphibian Designs. Early 20th century. Cotton factory cloth. 11.6 in. x 17.1 in. 2011.4.53 Panama Canal Museum Collection, George A. Smathers Libraries. Gift of Bertha B. Read. This early mola includes a motif that was often repeated, of frogs. Frogs and other amphibians fascinated Kuna people because of their ability to live in the water and on land. Because they produce many offspring at once, they are a symbol of fertility. 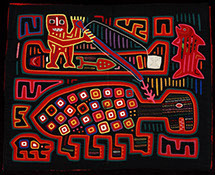 The patterned cloth behind the solid red layer indicates that this is an older mola. Mola with Panama Canal Locks. c. 1960. Cotton factory cloth. 15.6 in. x 20.5 in. 2011.4.229 Panama Canal Museum Collection, George A. Smathers Libraries. Gift of Bertha B. Read. 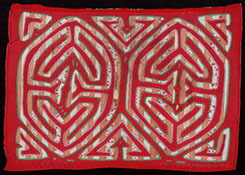 The subject of this mola design is ambiguous, as it resembles a traditional image of a spirit dwelling or spirit ship, but it could be an abstract rendering of a lock of the Panama Canal. Towers with distinctive pyramidal roofs flanking the locks seem to be pictured here, along with a ship and spectators. Mola with Sea Turtle Hunters. c. 1970. Cotton factory cloth. 14.1 in. x 17.8 in. 2011.4.474 Panama Canal Museum Collection, George A. Smathers Libraries. Gift of Bertha B. Read. In the past, Kuna fishermen harvested sea turtles for local consumption. As amphibious creatures, they were considered to be extraordinary, and turtle bones were used by soothsayers and healers. Harvesting turtle shells for sale became a significant source of income for the Kuna but over-hunting by the late 20th century has led to the decline of turtle populations. The boldly marked shell of the turtle depicted in this mola may illustrate the Hawksbill, one of the most sought after species that is now endangered. Mola with Balboa Portrait. Late 20th century. Cotton factory cloth. 12.7 in. x 14.8 in. 2011.4.211 Panama Canal Museum Collection, George A. Smathers Libraries. Gift of Bertha B. Read. Since 1904, the official Panamanian currency was named after Vasco Nuñez de Balboa, who was the first European to cross the Isthmus of Panama and see the Pacific Ocean. In 1930 a coin with the portrait of Balboa was minted as the half or “medio” Balboa. The coin, made of mostly silver, was also valued as a form of adornment. Kuna women wore necklaces made of Colombian silver coins at least as early as 1853 and later added Panamanian coins. That practice may have inspired the use of the coin design for this mola. Blouse with Spirit Being. c. 1990. Cotton factory cloth. 2013.9.60 Panama Canal Museum Collection, George A. Smathers Libraries. The creature on this mola blouse has both human and animal features. It appears to be a woman with webbed hands and feet and amphibious limbs, suggesting she is part frog or turtle. The pointed teeth suggest she may be a nia, or demon. Alternatively, she may be a beneficent being, as the xray-like view of the ribcage may be an allusion to the use of turtle bones in healing practices. Mola for Political Party. Late 20th century. Cotton factory cloth. 13.5 in. x 17 in. 2011.4.175 Panama Canal Museum Collection, George A. Smathers Libraries. Gift of Bertha B. Read. The Partido Liberal Nacional (PLN) came into being following Panamanian independence from Colombia in 1903. It was celebrated in mola designs before it merged with other parties in the last decade. This mola advocates for the PLN but also voting rights, a subject critical to the Kuna who struggled to establish a politically and culturally autonomous district, Comarca Kuna Yala.